PROVO, UT—Jolly Fish Press (JFP) has successfully acquired the North American distribution and publication rights to Lehua Parker’s debut children’s book, One Boy, No Water. 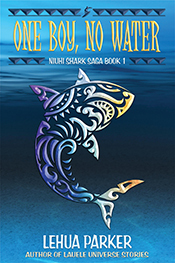 One Boy, No Water, the first of five books in the Niuhi Shark Adventure Series, is a fantasy based on an island folklore centered on the Niuhi shark people in Hawaii— imagine water people, angry teenagers, confused parents, a looming mystery, and man- eating sharks! The book is scheduled for a Fall 2012 release. Originally from Hawaii and a graduate of The Kamehameha Schools, Parker—also known as “Aunty Lehua”—has always been an advocate of Hawaiian culture and literature. Her writings often feature her island heritage and the unique Hawaiian pidgin. 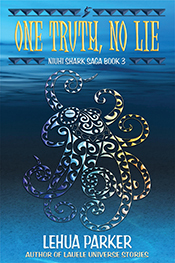 The Niuhi Shark Adventure Series will be JFP’s first middle grade series to be released in the Fall of 2012. I’ve been working off and on a middle grade children’s series set in Hawaii for several years. It wasn’t that I didn’t enjoy writing it—I did—and it wasn’t that I kept running out of ideas—if anything, I had too many. The problem was a much bigger question. What was I going to do with it when it was done? There are as many reasons to write as there are writers, some of them noble and pure of purpose and others more, ahem, monetary in nature. The “what to do with it” question was compounded by the fact that my kolohe characters kept insisting on talking in pidgin. Hawaiian Pidgin English, as in Not Standard English which is what most middle grade kids are learning to read in America. No publisher in his right mind would want to tackle a problem like this and the dearth of Hawaiian writers on the national stage publishing works with pidgin seemed to back up this theory, Lois Ann Yamanka and Graham Salisbury being the few exceptions that prove the rule. So the series lurked in the background of my mind and computer, rising to the surface when no other productive use of my time could be found to avoid housework. What can I say? Laundry has to get done and dishes washed, but like death and taxes I try to avoid them as long as possible. “Working on the series” sounded like a great excuse to me. A couple of months ago, bored and looking for “a project,” I attended a workshop on the emerging field of self-publishing. Books and publishing—the act of getting the stories into the hands and minds of readers—are undergoing a revolution not seen since Gutenburg showed off his fancy new press. Ebook readers and new distribution channels have created unparalleled opportunities for authors to reach highly targeted audiences and to achieve that basest reason of all for writing: a paycheck. I would have shouted eureka, but that would have been a little cliché. Now that I knew what I was going to do with it, I set about writing again and putting all of the building blocks in place to self-publish. Author website and store, check. Blog, check. Fan Facebook page, check. Research best practices, check. Someone to do cover art, check. Huh. All of this work was based on the assumption that no mainland publisher would be interested in a middle grade series with pidgin dialogue. Through a series of events that no one would believe if I told them, I got the series in front of a real live traditional mainland book publisher who is seriously considering the books for publication on the national level in a five book, five year deal that doesn’t seem real. The details are still being worked out and nothing is final until the ink is dried on the contract, but wow lau-lau, apparently there is a Santa Claus, Virginia, and for Lehua, a mainland publisher who thinks there’s a market for middle grade fiction with pidgin dialogue. I hated having t o go to a new school, and the change between Kahului Elementary on Maui and Kamiloiki Elementary on Oahu couldn’t have been more dramatic. At Kahului the kids were only one or two generations from the sugar cane plantation and lived in multi-generational homes. The teachers taught in pidgin, and everyone had one pair of slippahs, period. At Kamiloki the kids were Japanese or haole from upper-middle class families and never wore the same clothes twice. Most kids were simply marking time in a public elementary on their way to a private intermediate school and had extra tutoring classes on weekends and afternoons to give them an extra edge. No one spoke pidgin, not even the kids, something I didn’t realize until the first parent-teacher conferences when Mrs. Goo, nose in the air, sniffed that I needed to learn standard English; my pidgin was deplorable. “Excuse me?” said Mom. Since I only spoke standard English to my mother, a haole from the mainland, she was understandably confused. 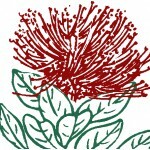 “I said Lehua does not speak English well. Her constant use of pidgin disrupts the class and the teaching I am doing. 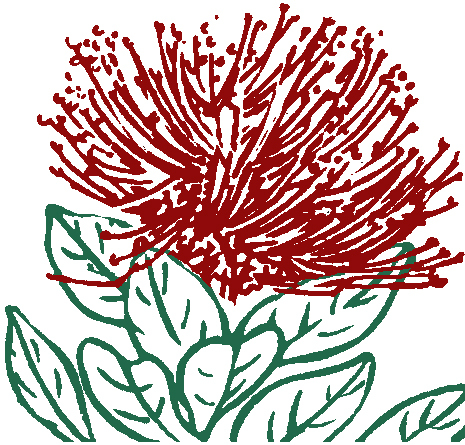 We speak English in this school, and Lehua does not.” She sniffed again. She was lucky it wasn’t raining. “Lehua, would you come here a moment?” she called. I popped my head into the doorway. “Yes, Mom?” I said. “Oh. I thought pidgin was for school and English was for home,” I said in perfect non-pidgin accented English. I glanced at Mrs. Goo. She was catching flies, her mouth was so open. “You need to speak as you are spoken to,” Mom clarified. “I’m sorry. I didn’t realize what I was doing. I think in both, so it’s hard sometimes to remember which I’m speaking. I’ll pay more attention.” I gave Mrs. Goo side eye. Wow, I thought, she going for one fly catching record! Oh, great, I thought, more drilling with tree/three, sshtreet/street, libarry/library. Shoulda sparked out da rules befoa time. At least I no going get lickins tonight. I hope. Unfortunately, things haven’t changed all that much since I was in Elementary school. Every school has its own rules and customs and heaven help the kid who can’t figure out which teacher is mean, which likes to joke, and when you can and can’t ask to go to the bathroom. My kids, Aaron and Cheryl, are both going to new schools this year, moving from a private school to public schools. While I knew there would be differences, I never expected some of the things we’ve discovered. Jay paused, confused. “No,” he said. Excerpted from One Boy, No Water by Lehua Parker. Copyright © 2012 by Lehua Parker. Excerpted by permission of Jolly Fish Press, LLC. All rights reserved. No part of this excerpt may be reproduced or reprinted without permission in writing from the publisher. One of the big stumbling blocks to writing Hawaiian fiction in the “bird,” as I recently heard someone call Pidgin, is finding the audience. Native Hawaiian Pidgin English speakers like to talk story and certainly sing story; read story maybe not so much. At least that’s the argument Hawaiian writers have heard for decades, along with it’s too low-brow, too stylized, and since Pidgin spelling isn’t officially standardized, just too much work for the reader, who, the naysayers claim, would rather be surfing or talking story or doing the laundry–anything–instead of reading or buying books. Having spent a lot of time over many years trying to find other authors publishing in Pidgin and finding something resembling a desert atoll, I think it’s less about whether or not Pidgin speakers are book readers, but about traditional publishing models. The Hawaiian writers are there with the stories, and I think the readers are too, but not on the scale that attracts the big print boys. What Pidgin literature exists is generally sanitized and stripped of most of the rhythm and flow of Pidgin and really just tosses in a phrase or two for flavor–trying to hit the largest audience possible and unfortunately missing the heart of Hawaii. Traditional publishing models believe there is no significant market for this kind of literature and therefore have found it too risky to promote. But eBooks are changing the way books are published and marketed. Niche markets take time to develop, and eBooks have virtually no expiration date–literally. EBooks allow authors to build audiences and demand over time without the immediate need for high returns to pay back the large investments traditional publishers make upfront in printing and promoting a book. So maybe with eBooks, we’ll all read a little more da kine. Nice, yeah? 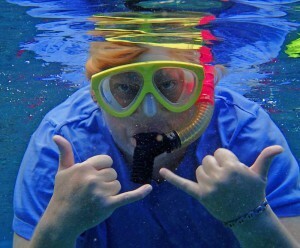 “I saw…I think I saw a shark,” said Jay. “Who’s a pretty girl, hah?” Nili-boy gave ‘Ilima a final ear ruffle and stood with a shrug. “You seen sharks out there before?” asked Uncle Kahana. 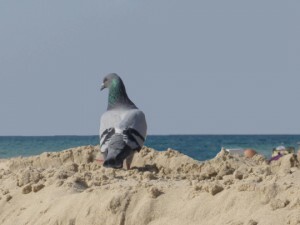 “Jay,” I said, and then I was gone, running full tilt over the rocks and to the beach, ‘Ilima at my heels. Originally from Hawaii and a Kamehameha Schools graduate, Lehua writes fiction set in the imaginary town of Lauele, Oahu. Her newest book, One Boy, No Water, Book 1 of The Niuhi Shark Saga, is scheduled for hardback and eBook publication on Sept. 22, 2012 by Jolly Fish Press. 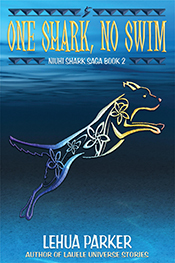 The Niuhi Shark Saga books are written in American English with lots of dialogue in Hawaiian Pidgin. Hawaiian Pidgin, or just Pidgin as it is called in Hawaii, is a polyglot language with its roots in Hawaiian, Chinese, Portuguese, Japanese, English, and Filipino. Hawaiian Pidgin developed as people from all over the world came to Hawaii in the 1800s looking for a better life. Over time, Pidgin has evolved into a heavily English-based language while retaining its original syntax, grammar, and lilt. While almost everyone in Hawaii today speaks, reads, and writes standard American English, true communication, the kind that speaks from the heart is in Pidgin. This blog is dedicated to all Pidgin speakers and the stories we tell.